IRVINE, Calif. – Dec. 3, 2015 — RealtyTrac® (www.realtytrac.com), the nation’s leading source for comprehensive housing data, today released its October 2015 U.S. Home Sales Report, which shows that among 94 major metro areas analyzed for the report, 33 markets (35 percent) have now reached new all-time home price peaks in 2015. The report also shows that the median sales price of U.S. single family homes and condos in October was $207,500, up 1 percent from the previous month and up 10 percent from a year ago — the highest year-over-year percentage increase since February 2014. The 10 percent increase in October 2015 came following 20 consecutive months of single-digit annual increases in median home sales prices and marked the 44th consecutive month with a year-over-year increase in median home prices. Despite nearly four years of increases, the U.S. median sales price in October was still 9 percent below the previous peak of $228,000 in July 2005. Metro areas that have reached new home price peaks in 2015 include Detroit, which hit a new peak in October with a median sales price of $155,000. Other metros that reached a new price peak in 2015 include Dallas, Houston, Atlanta, St. Louis, Denver, Pittsburgh, Charlotte, Portland, San Antonio and Columbus, Ohio. There were a total of 2,815,704 single family homes and condos sold in the first 10 months of 2015, according to public record sales deeds collected by RealtyTrac. That was a nine-year high for the first 10 months of the year and a 6 percent jump from the same time period in 2014, when there were a total of 2,667,436 single family and condos sold in the first 10 months of the year. Among 94 major metropolitan statistical areas with 500 or more sales with home price data available in October 2015, 84 (89 percent) saw an increase in sales prices from the previous year, while only 10 metros saw a decline in median sales prices from a year ago. Those with the biggest annual increase in median sales price were Detroit, Michigan (up 29 percent), Charleston, South Carolina (up 17 percent), Denver, Colorado (up 17 percent), St. Louis, Missouri (up 16 percent), Bridgeport, Connecticut (up 15 percent) and Cape Coral, Florida (up 15 percent). Other major markets with double-digit appreciation compared to a year ago included Palm Bay, Florida (up 15 percent), Modesto, California (up 14 percent), Raleigh, North Carolina (up 14 percent), Washington, D.C. (up 13 percent), Philadelphia, Pennsylvania (up 13 percent), and Ocala, Florida (up 13 percent). Cash sales may be down from their peak of 41.1 percent in February 2011, but October 2015 saw the share of cash sales increase on a monthly basis for the third consecutive month, with all-cash sales accounting for 28.9 percent of all sales during the month — up from 28.4 percent in the previous month but still down from 30.4 percent a year ago. RealtyTrac analyzed 230 metros with at least 10 or more cash sales and at least 100 sales in October 2015 and found that more than half (128 metros) saw a monthly percent increase in cash sales. Metros with the highest share of cash sales included Homosassa Springs, Florida (61.4 percent), Naples, Florida (60.1 percent), Columbus, Georgia (54.9 percent), Miami, Florida (53.7 percent), Greeneville, Tennessee (52.8 percent) and The Villages, Florida (52.2 percent). RealtyTrac analyzed 127 counties with at least 500 sales in October 2015 and where home price data was available both on the most recent purchase and the previous purchase. In 15 of those counties (12 percent) home sellers on average in October sold for a lower price than what they purchased for. Counties where sellers on average sold for the biggest percentage loss were Burlington County, New Jersey in the Philadelphia metro area (13 percent loss), Kane County, Illinois in the Chicago metro (9 percent loss), Shelby County, Tennessee in the Memphis metro area (4 percent loss), Guilford County, North Carolina in the Greensboro metro area (4 percent loss), and Cook County, Illinois in the Chicago metro area (4 percent loss). Counties where sellers on average sold in October for the biggest percentage profit since purchase were Alameda County, California in the San Francisco metro area (75 percent gain), Santa Clara County, California in the San Jose metro area (61 percent gain), San Mateo County, California in the San Francisco metro area (58 percent gain), San Bernardino County, California in the Riverside metro area (52 percent gain), and Multnomah County, Oregon in the Portland metro area (51 percent gain). Other counties where sellers realized hefty gains in October were Denver County, Colorado (49 percent gain), Travis County, Texas in the Austin metro area (48 percent gain), Contra Costa County, California in the San Francisco metro area (48 percent gain), King County in the Seattle metro area (48 percent gain), and Orange County, California in the Los Angeles metro area (46 percent gain). Buyers using Federal Housing Administration (FHA) loans — typically low down payment loans utilized by first time homebuyers and other buyers without equity to bring to the closing table — accounted for 16.1 percent of all single family home and condo sales with financing — excluding all-cash sales — in October 2015, down from 16.9 percent in the previous month but up from 12.6 percent in October 2014. Metro areas with the highest share of FHA buyers in October 2015 included Ogden, Utah (34.2 percent), Visalia, California (30.9 percent), Salt Lake City, Utah (30.6 percent), Elkhart, Indiana (29.9 percent), Yuma, Arizona (29.9 percent), and Merced, California (29.5 percent). Sales of homes to institutional investors — entities that purchase at least 10 properties during a calendar year — accounted for 3.6 percent of all single family home and condo sales in October, unchanged from the previous month but down from 5.5 percent in October 2014. Among markets with at least 100 or more total sales in October 2015, those with the highest share of institutional investor purchases were Killeen, Texas (12.4 percent), Columbus, Georgia (12.2 percent), Jacksonville, North Carolina (11.6 percent), Huntsville, Alabama (10.1 percent), and Memphis, Tennessee (10.1 percent). “It’s interesting to note that the top four markets for institutional investors are all small- to medium-sized markets near military bases,” Blomquist noted. In October 2015, 8.1 percent of all sales were bank-owned (REO) single family homes and condos. This was unchanged from the previous month but down from 10.6 percent of all sales in October 2014. The October median sales price of a bank-owned home was $121,000, 42 percent lower than the overall median home sales price during the month. Metros with the highest share of REO sales in October 2015 were East Stroudsburg, Pennsylvania (31.7 percent), Bakersfield, California (25.5 percent), California, Maryland (24.5 percent), Tallahassee, Florida (20.3 percent) and Jacksonville, Florida (19.0 percent). Short sales accounted for 5.2 percent of all single family and condo sales in October, unchanged from the 5.2 percent in the previous month but down from 5.5 percent a year ago. Markets with the highest share of short sales in October were Salisbury, Maryland (13.5 percent), Torrington, Connecticut (12.6 percent), Atlantic City, New Jersey (12.6 percent), Yuma, Arizona (11.0 percent), Jacksonville, North Carolina (10.8 percent) and Providence, Rhode Island (10.2 percent). Markets bucking the national trend with a year-over-year increase in share of short sales included Springfield, Massachusetts, Ocala, Florida, Worcester, Massachusetts, Baton Rouge, Louisiana and Fayetteville, North Carolina. Report methodologyThe RealtyTrac U.S. Home Sales Report provides percentages of distressed sales and all sales that are sold to investors, institutional investors and cash buyers, a state and metropolitan statistical area. Data is also available at the county and zip code level upon request. The data is derived from recorded sales deeds, foreclosure filings and loan data. Statistics for previous quarters are revised when each new report is issued as more deed data becomes available for those previous months. Median sales price is calculated based on the sales price on the publicly recorded sales deed when available. If no sales price is recorded then the purchase loan amount is used to calculate median price, and if no purchase loan amount is available, the property’s Automated Valuation Model (AVM) at time of sale is used to calculate the median price. DefinitionsAll-cash purchases: sales where no loan is recorded at the time of sale and where RealtyTrac has coverage of loan data. In-foreclosure sale: a sale of a property that occurs while the property is actively in default (NOD, LIS) or scheduled for foreclosure auction (NTS, NFS). About RealtyTrac RealtyTrac is a leading provider of comprehensive U.S. housing and property data, including nationwide parcel-level records for more than 130 million U.S. properties. Detailed data attributes include property characteristics, tax assessor data, sales and mortgage deed records, distressed data, including default, foreclosure and auctions status, and Automated Valuation Models (AVMs). Sourced from RealtyTrac subsidiary Homefacts.com, the company’s proprietary national neighborhood-level database includes more than 50 key local and neighborhood level dynamics for residential properties, providing unrivaled pre-diligence capabilities and a parcel risk database for portfolio analysis. RealtyTrac’s data is widely viewed as the industry standard and, as such, is relied upon by real estate professionals and service providers, marketers and financial institutions, as well as the Federal Reserve, U.S. Treasury Department, HUD, state housing and banking departments, investment funds and tens of millions of consumers. ARE WE DRIVING INTO ANOTHER HOUSING BUBBLE? The topic of bubbles forming in the housing market is something that has been thrown around for quite some time. As home prices soar to new heights—with no sign of decline—housing bubbles appear to be popping up in many markets. Housing markets situated in ever-popular (and expensive) San Francisco, California are showing bubble signals, but experts believe that other markets are not too far behind. Zillow's Home Price Expectations Survey of 108 panelists showed that one-third of respondents agreed that the San Francisco housing market is in a bubble, while 20 percent indicated that the market is at-risk for bubble conditions in the next year. "Without 20/20 hindsight, it's difficult to identify bubbles as they're happening, but it is very clear that nationally we are not seeing a return of the conditions that caused the last national bubble," said Dr. Svenja Gudell, Zillow's Chief Economist. "Tighter lending restrictions today mean we aren't seeing buyers get loans they realistically can't pay back, like we did in years past. It's significant that some experts are starting to worry about bubble conditions, but in my opinion, there's no real danger of a severe crash like the one we all remember from the last decade." In addition to San Francisco, California, New York City, New York; Houston, Texas, and Los Angeles, California; Miami, Florida; San Diego, California; and Seattle, Washington were at the top of Zillow's list markets that are already in a housing bubble. "A handful of markets–especially the Bay Area–are very hot right now, and it's possible home values may actually begin to fall somewhat in these places as more residents are priced out amidst rising affordability concerns, especially when interest rates rise. Whether those local conditions constitute a 'bubble' is up for debate, even among economists," Dr. Gudell explained. According to Zillow's panelists, home values are projected to grow at an annual rate of 3.9 percent through the end of 2015, which shows that the housing market will start to slow. All panelists agreed that the expected average annual home-value appreciation rate is now just over 3 percent, resulting in a national median home value of more than $215,000 by the end of 2020. "The long-term outlook for U.S. home values has diminished to a three-year low, and a clear-cut consensus among the experts remains elusive, even at the national level," said Terry Loebs, Pulsenomics Founder. "Based on the projections of the most optimistic forecasters, home values nationally will increase 4.7 percent next year and surpass their May 2007 peak levels in April 2017. Loebs continued, "In contrast, the data collected from the panel's most pessimistic respondents expect only 2.3 percent appreciation for next year, and even more subdued appreciation thereafter–a path that would delay the market's eclipse of the bubble peak until September 2019. The divergence of expert views regarding the existence of regional price bubbles and the path of future home values is a reminder that the U.S. housing sector has yet to fully heal more than eight years after the epic bust, and that significant risks have re-emerged within certain large metropolitan area housing markets." The long, steady recovery from the housing crisis and the recession that followed is nearly over, with the consumer lending market, including mortgages, expected to recover completely in 2016, according to a new report fromTransunion. The largest boom in new apartment construction in three decades is doing little to slow rent increases or ease affordability concerns for renters across the country, a new report finds. A record number of renters are spending more than 30% of their incomes on rent—a ratio that economists consider financially burdensome, according to a report released Wednesday by Harvard University’s Joint Center for Housing Studies. The report, “America’s Rental Housing: Expanding Options for Diverse and Growing Demand,” says more than 21 million households are burdened by how much they pay in rent, up from fewer than 15 million in 2001. 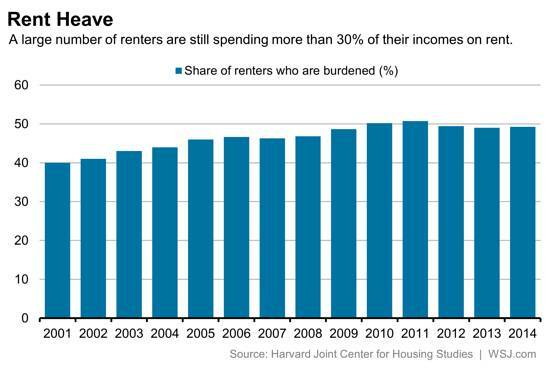 Nearly half of renters are paying more than 30% of their incomes in rent, the report says. While that is a slight improvement from 2011, it remains above where it has been for most of the last 13 years. Inflation-adjusted rents rose 7% from 2001 to 2014, while renter household incomes fell 9%, creating affordability challenges for many renters. A recent boom in construction would normally be expected to ease such concerns by providing a flood of new supply. One reason that hasn’t happened is simply that new supply hasn’t kept up with the swell in demand. In mid-2015, 43 million families and individuals lived in rental housing, up nearly 9 million from 2005—the largest gain in any 10-year period on record. In contrast, the number of rental units expanded by just 8.2 million, most of that from the conversion of single-family homes into rentals. “As much as we’ve seen an increase in rental supply, the increase in rentals demand has been astounding,” said Chris Herbert, managing director of the Joint Center for Housing Studies. Another factor is that much of the new supply is aimed at higher-income renters. The median asking rent for new market-rate apartments hit $1,372 last year, a 26% increase from 2012, according to the report. Developers say this partly reflects increases in land prices and construction costs, which make it difficult to build anything but high-end buildings. “As my father always says, a sheet of drywall doesn’t care if it’s in a luxury high-rise or an affordable housing project—it costs the same,” said Toby Bozzuto, president and chief executive of the Bozzuto Group, a Washington-area builder. So far at least, those high-priced apartments are being gobbled up by young professionals renting well into their 30s and retirees downsizing into apartments. The number of higher-income renters earning $100,000 or more has grown by 1.6 million over the last decade. Households over age 40 now make up the majority of renters, according to the report. The report’s findings underscore a challenge to helping especially middle-income renters. Years of low rates of rental construction have created a shortage of older rental units affordable to firefighters and paralegals. It is likely to take years for some of housing being built now now to come down in price, leaving cities struggling to hold onto middle-class families. “I think the prognosis unfortunately is probably not good,” Mr. Herbert said.